Wow, what a wonderful find. This genuine vintage Fisher Price toy is a real blast from the past. Pull a long toys are still a favourite toy for children today. This vintage wooden and plastic 1961 Fisher Price children's toy makes a noise as you pull it along. 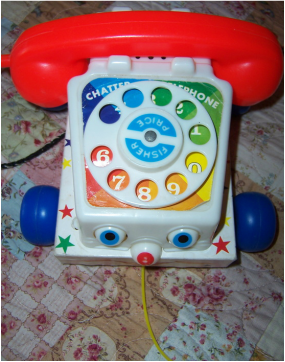 It is a called a "chatter telephone" as it makes sounds as you pull it along. The graphics are still very bright, and a wonderful vintage toy from Fisher Price - Made in USA. This small wooden cut-out bee pull a long toy was made by Fisher Price circa 1970, and was made in USA. Buzzy Bee is a wooden cut out toy with paper transfers on the side and ends to look like a yellow bee with big blue eyes and a yellow brown striped tail. Buzzy has a white plastic crown on its head with two attached spring antennae with a red plastic bead on each. It has red plastic wings on the side that turn as Buzzy is pulled along. The antennae bounce, the wings twirl and Buzzy Bee makes a clicking buzzing sound as it is pulled. Buzzy has two blue plastic wheels which are painted with white painted flowers.. Measures approx 15cm long,10cm high, 15cm wide. It is in very good condition with very little wear to the paper transfers, and blue wheels, and also has its original yellow plastic pull a long lead. 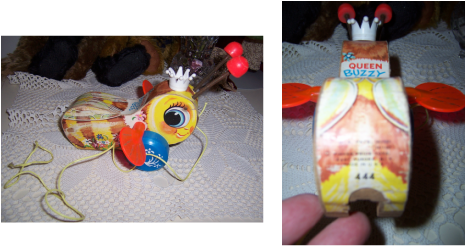 This cute helicopter is a wooden pull a long toy made by Fisher Price in circa 1970. It has the number 448 on its back and was made in USA. It has blue paper transfers on the sides with a picture of a dog, and a boy and girl driving it. It has yellow plastic rotor blades on top, and a yellow back rotor which is a back wheel as well. The helicopter makes a soft whirring sound when pulled. The front of the helicopter rolls on two small red balloon type plastic wheels. It is in good condition with a little rippling effect to the paper and some wear to it, and retains its original yellow plastic lead. This is a wooden pull a long toy made by Fisher Price circa 1960 with the marking of 693 on his neck. He is a bit of a quandary as the dog itself seems to be old (has C '65 on its back) but the shoe is not hanging from his mouth, and is at the end of the lead and is made of plastic. The earlier Snoopy dogs had a wooden shoe in its mouth. Snoopy is a wooden cut out dog with paper transfers on the sides and edges of a white dog with brown and black markings. He has a long metal spring tail with a green plastic bead on the end, dark brown hard plastic ears, and he pulls along on 4 red plastic balloon type wheels. He has his original red pull string with a yellow plastic shoe at the end of it. When he is pulled , Snoopy wobbles, his tail wags, and the ears move. He makes a sound when pulled along that is supposed to sound like a "yipping" dog. He has all of his transfers on him but they do show wear particularly around his nose area. If you want to see more pictures then please ask. This is a vintage wooden Fisher Price pull a long large "Snoopy" dog with the number 181 on his back and the date c'61 Made in USA. He is one of the most popular pull toys that Fisher Price has ever made. He is a wooden cut out dog with paper transfers on all sides of him. He is a white hound dog with brown and black body very similar to our "Lil Snoopy" dog. He has wooden cut out double jointed legs with paper transfers on the sides, floppy brown leather (replaced) ears, white plastic feet, long metal spring tail with a red wooden knob at the end, and an original red plastic leash attached to the top of his neck. The leash has "Fisher Price" printed on it and the handle loop of it has broken off in a past life. When pulled along "Snoopy" makes a clicking sound, his four feet move, and his spring tail wobbles. He is quite large - approx 34cm long and 12cm tall. Snoopy is approx 50 years old, and is showing his age. His transfers on parts of his body are worn away, his spring tail has been reglued by a past owner, his ears have been replaced and are virtually the same as the old ears, and his lead is broken at the end. Never the less "Snoopy" is a wonderful wooden pull toy with all of his mentioned faults, and displays very nicely. These large "Snoopy" dogs are becoming very hard to find. 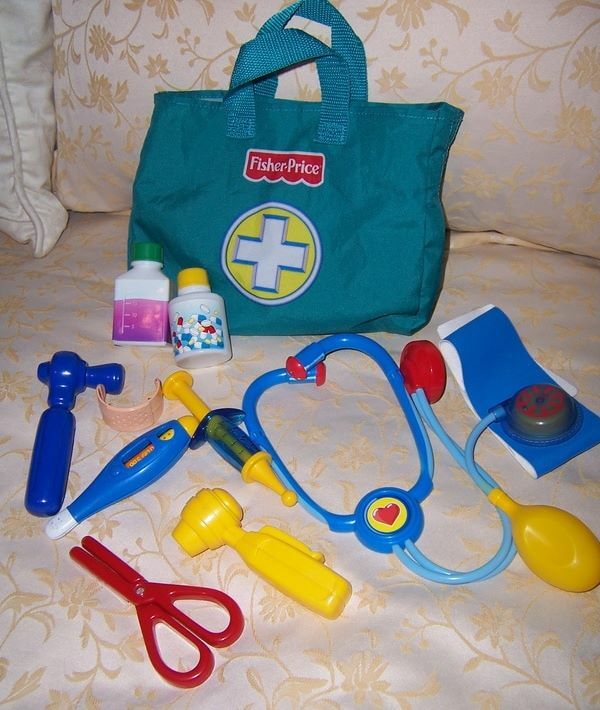 ''MEDICAL DOCTORS NURSE KIT BAG"
This doctors/nurses kit carry bag is green nylon and does up with velcro. It still retains the original Mattel/Fisher Price label inside it. It has the medical items from the original set plus extras we have found extra items to make pretend play just that little bit more fun. Just what the Doctor ordered for fun play.